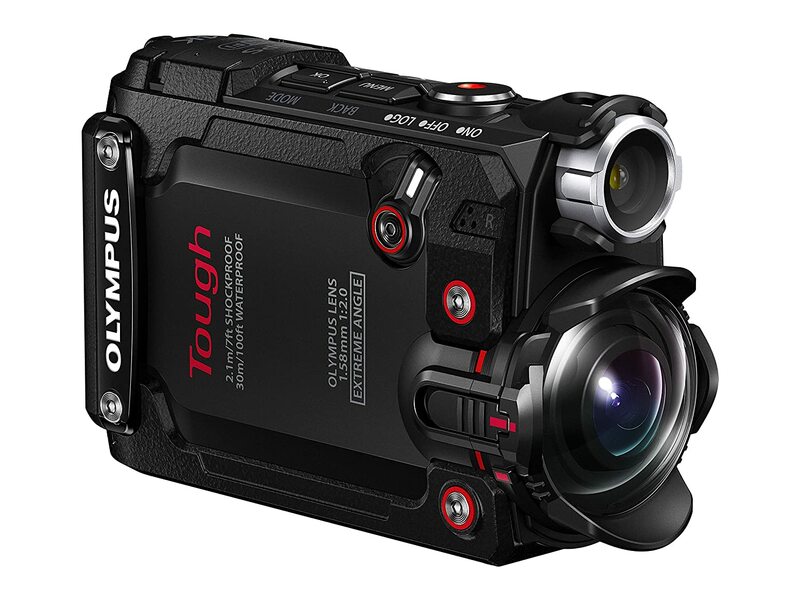 Careful not to mistake the Olympus’ TG-Tracker for your average range finder, because they look pretty similar. The TG-Tracker is an action camera ideal for hunting. Why? 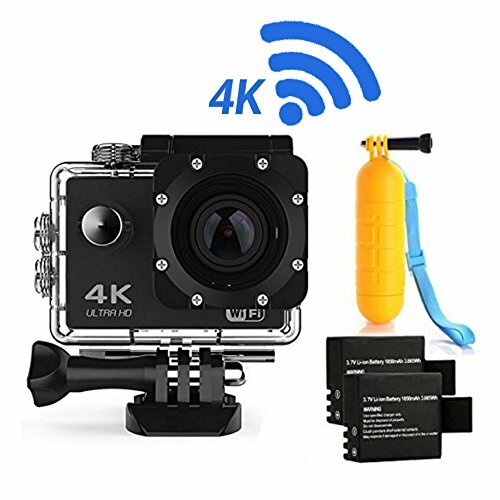 It’s got some unique features that separate it from action cameras you’ll take snorkeling, snowboarding, or off-roading. 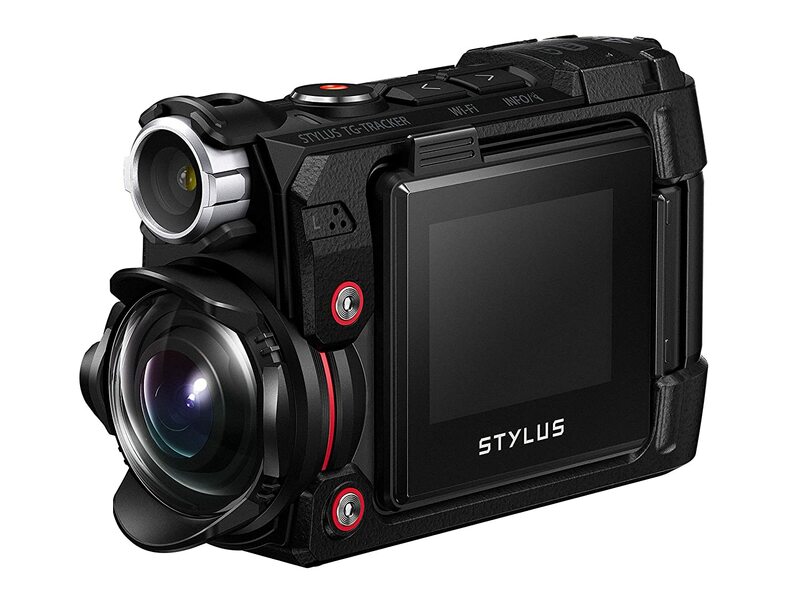 Here are other action cameras that are more rounded in terms of capability. What should you want in an action camera? If you’re a hunter, the first thing you’ll probably think of is camouflage, but that’s not always the case. Let’s explore some of these categories and find out why the TG-Trackers is the ideal hunting action camera. The TG-Tracker doesn’t look like your typical action camera. Its interface is actually on the side and flips out backward. You hold the camera much like a range finder instead of on a selfie stick where its pointed back at you. You can still mount the TG-Tracker on a stick, but it’s not quite the ideal selfie taker. It might not be a tank, but it sure is built like one. The TG-Tracker is built to endure the occasional drop or mishandle, but that doesn’t mean you should actively look to destroy it! The most important thing you can do to extend its lifetime is to use it responsibly. Don’t let the odd design of the TG-Tracker detract from your thoughts about its camera. 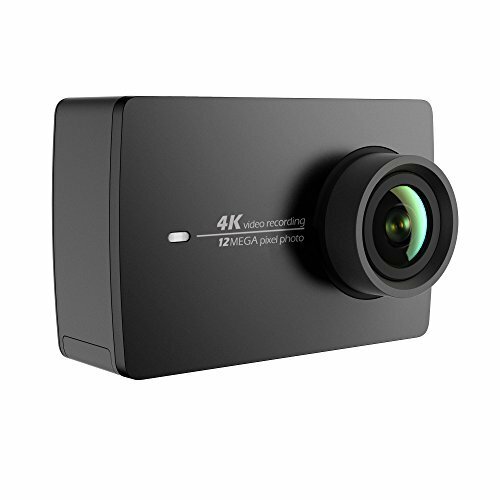 It wields an impressive 4k quality at 30FPS camera which is the best you can get for any action camera. Whatever you plan on viewing on your hunting trip, the TG-Tracker will capture it all for a pretty affordable price. The TG-Tracker’s camera can see 204 degrees in front of itself, about 24 degrees wider than most adventure action cameras. It isn’t panorama but it gets pretty close. It’s ideal for spotting and capturing things that might be outside of what even you can see. The TG-Tracker’s systems are what are going to appeal to most hunters. 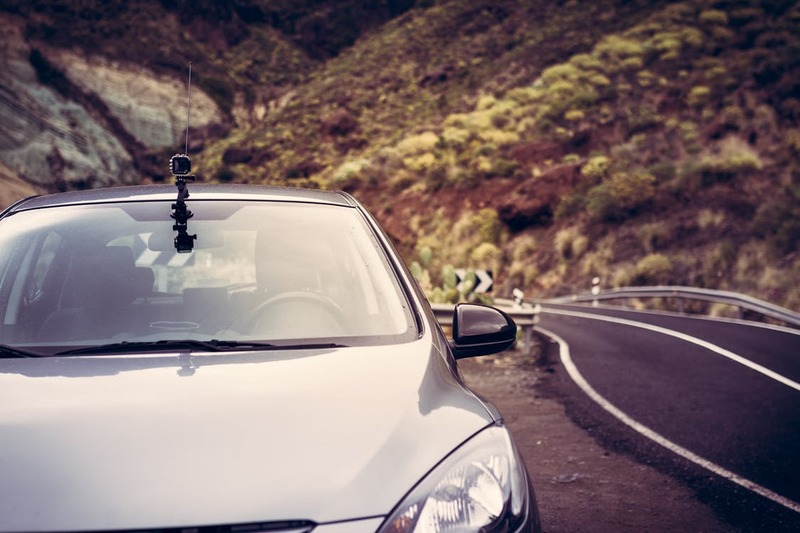 Aside from the high-quality camera, it comes equipped with various outdoor-focused sensors such as GPS, eCompass, accelerometer, thermometer, and a barometer. 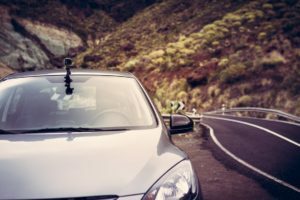 There are few if any other action cameras that come equipped with these features. To have all these sensors on one device will lessen the load on hunting trips or outdoor excursions in general. If you’re trying to be efficient with your energy and the terrain you travel, the TG-Tracker has a log feature that will record your movement and even data on your environment for your future study. If there was a camera built exclusively for living in the outdoors, the TG-Tracker would be it. It’s not cheap, but it isn’t terribly expensive either. Its versatility in terms of available features will appeal to hunters and outdoorsman alike. The TG-Tracker compares not too unfavorably with the GoPro HERO5 in terms of overall capability. Both cameras are built for the outdoors but the TG-Tracker can probably handle a little more punishment. Regardless of comparison, anyone who purchases the TG-Tracker with the intent to capture nature in its prime is going to be satisfied. You may recognize the brand Garmin by their exceptional fitness trackers (Click here to see comparisons of Garmin fitness trackers). We’ll be looking at the VIRB Ultra 30 and how it shapes up to a similar competitor, the HERO5. 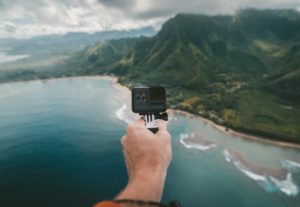 Both action cameras are top of the line when it comes to quality, looks, stability, and reliability. The HERO5 is the face of the current action camera industry but that shouldn’t count out the VIRB. These two cameras actually shape up pretty well when compared to one another. Both are not exactly cheap and easily replaceable, but they’ll be worth your while if they’re well kept and maintained. That being said, let’s get into the review. Both cameras are capable of 4k/30FPS quality settings. This is the best setting on action cameras on the market. It’s going to eat up battery more quickly than lower settings, but we’ll leave that up to you to decide. The quality settings are nice, but they won’t do much good if you can’t get the perfect shots. That’s why both cameras employ similar stabilization systems to prevent the camera from shaking during a rickety ride. You’d think looks and style won’t factor into a purchase, but you’d be surprised how many people judge a book by its cover. The VIRB and the HERO5 are both great machines, but the HERO5 is overall a smoother and more intimate design. It’s nothing personal, but if you want to have the sweetest looking action camera in the wilderness, the HERO5 is going to show that you’re pretty serious about capturing the best sights the world has to offer. The HERO5 doesn’t have any of the excess buttons or designs along the top or front of the camera. It’s as simple of an action camera as you can get with all the perks of being a high-quality device. At first, we thought the HERO5 has this category in the bag but upon further inspection, the VIRB actually surprised us. The VIRB actually has a variety of systems including GPS and performance monitoring sensors that measure speed, elevation, heart rate, and probably the most unique of all—G-Force. We imagine that the VIRB is being used by a variety of aviators from wing-suiters to fighter pilots, hence why this measurement is included. The HERO5 has none of these features. It makes sense that Garmin, a noted GPS and fitness tracker producer, would include these features on its action camera. If you’re looking to combine photography/videography with your exercises, then the VIRB is the camera for you. You’ll be surprised to find that despite the various buttons on the VIRB, it’s actually voice-controlled (to a certain extent) like the HERO5. Both cameras require at least some finger contact to manage the videos on the back screen, so voice control only goes so far. The HERO5 is going to be simpler to use due to the fact that it only has one button. That being said, both cameras try to minimalize the excessive button pushing as much as possible. Simply put, it’s your ultimate outdoor action camera. 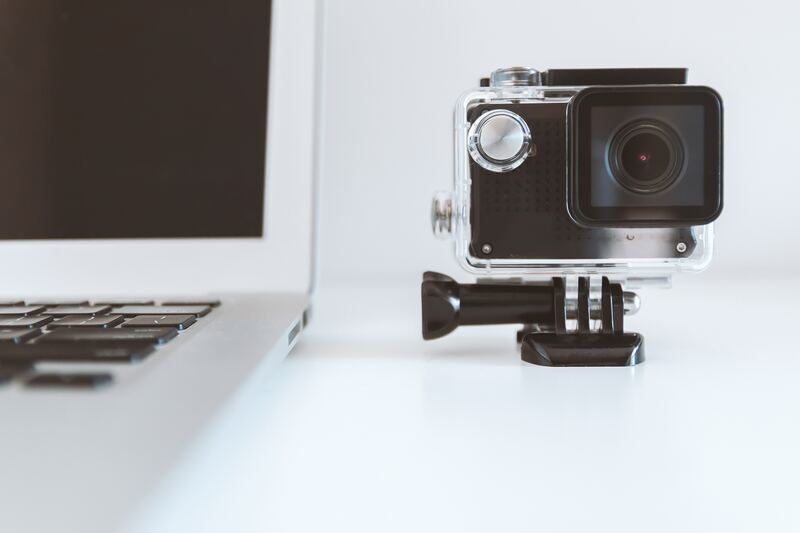 With other cameras, we can understand how you might be careful with them and be hesitant to take them into the most extreme conditions. Not the VIRB, because this little machine was built to handle mother nature in all her forms. 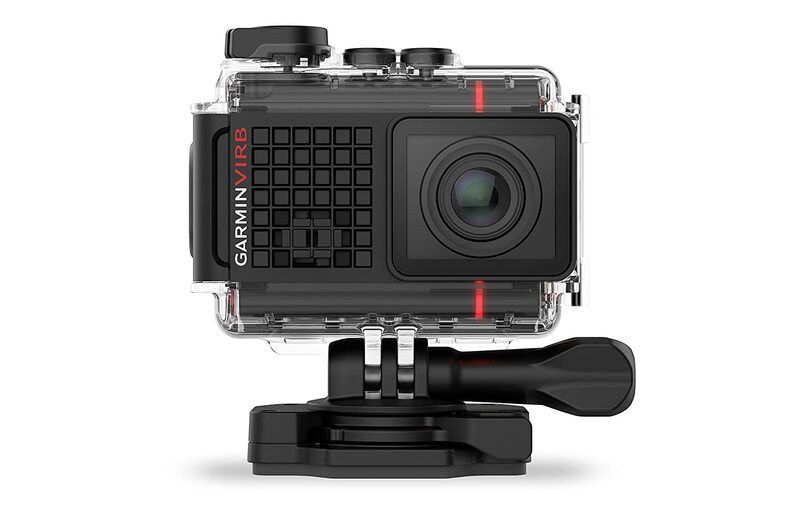 If you’re looking for a good action camera that isn’t as expensive as the GoPro HERO5 or the Garmin VIRB Ultra 30, then you’re in luck. The YI action camera is here to alleviate your worried wallet and still provide you with a quality piece of optic gear. You probably don’t hear about the YI that often because GoPro really does dominate the market. However, the YI has certainly made a name for itself among its happy users. Why? We’ll let it speak for itself. The YI is fully capable of 4k/30FPS quality. Let’s face it, this is the first thing that everyone looks for on any action camera these days. If you’re concerned about battery life, there are lower quality settings which won’t get you the coveted HD videos and photos but they’ll be the next best thing. Like the more high-end action cameras, the YI employs a three-axis stabilization technique in order to keep the camera from bouncing around. Shaky videos and blurry shots will be a thing of the past with the YI and others like it. What makes the YI different is that you can get all these perks for a relatively cheap price. With an interactive touch screen, you can edit photos and videos on the back of the camera. You won’t have to worry about the tedious nature of computer editing software when you can do pretty much what you need on the go. The camera has built in Wi-Fi to allow you to share what you’ve captured to sites like Facebook and YouTube. The YI lacks the diverse shooting methods that make cameras like the HERO5 so popular. It’s not a huge loss that the YI doesn’t have features like slow motion because it makes up for it in having 4k quality in the first place. 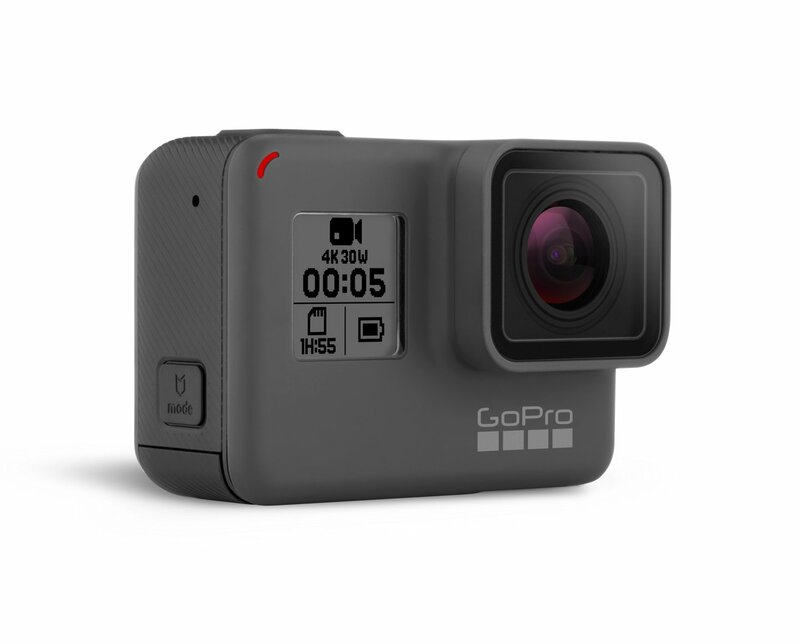 This action camera is even smoother and less bulky than the HERO5 and the VIRB. Literally, it’s like a box with a camera lens sticking out of it. If you put it in its watertight case, not to worry. The YI fits just as nicely and overall is a pretty neat looking camera to behold. Its touch screen also features Gorilla glass, a toughened material that will resist scratches and scrapes that are more likely to scuff the exterior of the camera. The YI is seriously underrated and we would like to see it in the hands of more happy outdoorsmen and women. 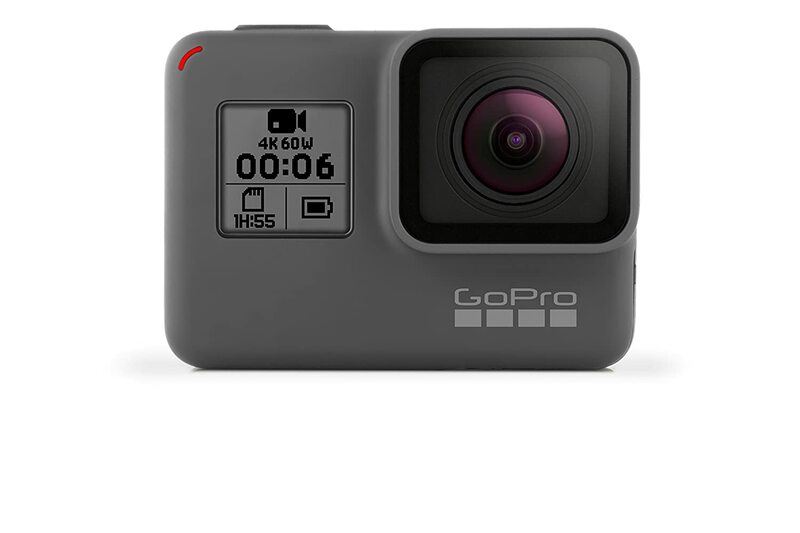 It’s got just about every spec to make it a premier action camera. Of course, 4k/30FPS shouldn’t be the only deciding factor in your decision to buy the YI. Regardless, we know the YI is going to satisfy the customer looking to take it into the wilderness and capture all the right moments. 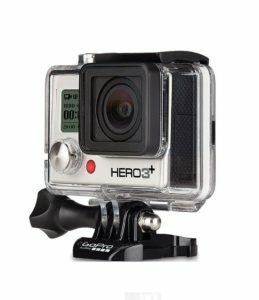 The HLS and HERO5 seem like opposite ends of the spectrum for comparing action cameras. However, there are some notable differences and similarities between the two that we believe you should be aware of. 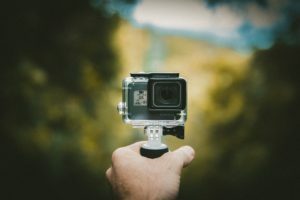 On our list of best action cameras (click here for the guide), we have the HLS and the HERO5 in different categories but both are at the top of those respective categories. Regardless of who comes out the winner of this match, both cameras are going to satisfy the amateur or the professional. 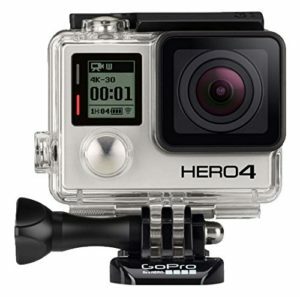 Both action cameras employ a 4k camera at 30FPS, the highest quality you can get on the market. However, the HERO5 has a massive advantage in recording time, nearly twice the HLS’s. You’ll be at the controls of the HERO5 for a lot longer than the HLS. Make no mistake, both cameras are going to capture awesome pictures and videos. However, if you want to have a more reliable camera for extended periods of time, the HERO5 is going to more favorable one. Both cameras have different resolutions. Not that you’d want anything less than 4k quality, but sometimes it can help save battery. This will be especially handy for longer trips. It was difficult to find a clear difference between these two cameras, but we decided on the HLS due to a number of stats. 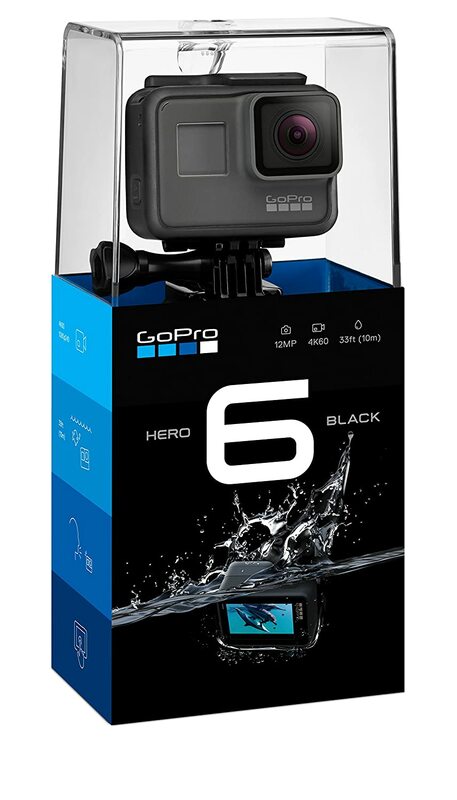 It can operate in the water beyond the range of the HERO5 and is more rugged in general. 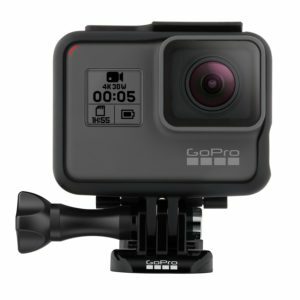 Because it is far cheaper than the HERO5, the camera itself and its accessories will still cost less than a single purchase of the HERO5. If you ever need to replace the HLS for major malfunctions, it won’t cost you too much if at all if you choose an additional warranty plan. The HLS has been proved on the same harsh terrain and conditions that the HERO5 is made for. Whether it be snow, rain, sleet, or underwater, the HLS is just as reliable as the HERO5. The HERO5 is by far the simplest action camera on the market despite its price. The HLS may be cheaper but a number of features that comes with the HERO5 are too great to ignore. For example, voice control and a single button to control recording are revolutionary that most other brands simply don’t have. The touchscreen on the HERO5’s back also makes handling your videos much simpler than using buttons on the side. The ability to edit those videos on the spot is a feature that clearly separates the HERO5 from the competition. The HERO5 is the winner in our minds but not by a huge margin. The HLS is a reliable camera with its one clear advantage being the price. 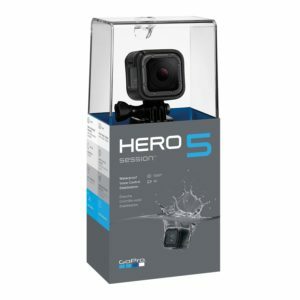 However, GoPro is a proven brand and the HERO5 is the crown jewel of the action camera fleet. Both cameras are built to handle the elements and still get amazing shots. But the HERO5 simply has stats on top of the ones it’s known for to extends its recording time and the ease of which you handle it.